This article from the Topeka Journal discusses farmers' efforts to reverse the effects of blowing soil in western Kansas. 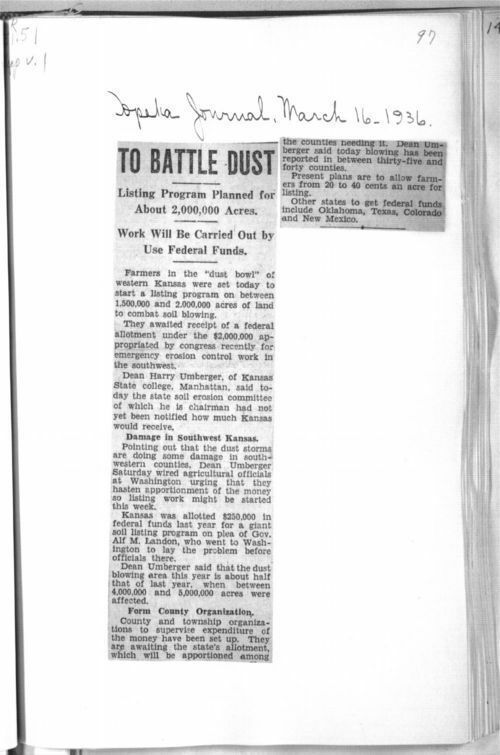 Farmers in the Dust Bowl would receive a federal allotment to fund the listing of between 1 and 2 million acres of land. The allotment was expected to be 20 to 40 cents per acre of land that was listed. This demonstrates some of the practical steps being take to limit soil erosion, including listing. This can demonstrate for students how farming techniques changed in response to the Dust Bowl. It could be grouped with the telegram to Governor Huxman (dated April 23, 1937) and the image of a farmer listing his land.